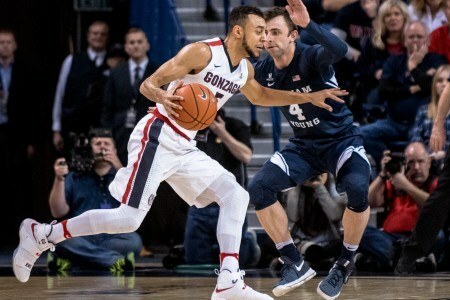 AUSTIN, Texas – Gonzaga men’s basketball’s Nigel Williams-Goss was named first team Academic All-America Division I basketball as selected by the College Sports Information Directors of America (CoSIDA). Williams-Goss recently completed his undergraduate degree in Psychology with a 3.84 GPA. He is now working on his master’s degree in Organizational Leadership. Williams-Goss becomes the sixth Zag to be named Academic All-American First Team, and the first since Kelly Olynyk in 2013. Previous winners include Dan Dickau (’02), Jeff Brown (’94), Jarrod Davis (’92) and Bryce McPhee (’85). A national finalist for the Naismith Trophy, the Oscar Robertson Award and the Wooden Award, Williams-Goss turned in a magical season for Gonzaga as it reached No. 1 in both national polls for the second time in program history (2013). The Cousy Award finalist currently leads Gonzaga in scoring (16.3 points per game, fifth in the WCC), assists (4.8 per game, fourth in WCC) and steals (1.7 per game, first in WCC). The redshirt junior is grabbing 5.6 rebounds per game. The Happy Valley, Ore. native tops the WCC at 90.9 percent from the free-throw line. Seven of the 15 members of the 2016-17 CoSIDA Academic All-America Division I men’s basketball teams have at least a 3.80 G.P.A., while three student-athletes carry a perfect 4.0 G.P.A. The five members of the first team have an average G.P.A. of 3.83. Four of the five student-athletes on the CoSIDA Academic All-America first team are repeat selections. Canyon Barry was named CoSIDA Academic All-America of the Year. Joining Barry as 2015-16 first team repeat selection and a 4.0 G.P.A. in graduate school is Grand Canyon University graduate student Joshua Braun. North Dakota State University junior A.J. Jacobson was a third team honoree last season while Williams-Goss was a third team pick during the 2014-15 season at Washington. The final choice of the first team is Valparaiso University graduate student Alec Peters. Evan Bradds, a senior from Belmont University, earns CoSIDA Academic All-America second team honors after begin selected to the third team a season ago. Other second team members include Vanderbilt University senior Luke Kornet, Southern Methodist University junior Semi Ojeleye and a pair of sophomores in Brigham Young University’s Eric Mika and Purdue University’s Caleb Swanigan. Elon University sophomore Tyler Seibring’s 4.0 G.P.A. leads the way for the CoSIDA Academic All-America third team. He is joined by Princeton University senior Steven Cook, senior Matt O’Leary from Indiana University-Purdue University Indianapolis, Brown University senior Steven Spieth and Central Arkansas University junior Jordan Howard.